Horse trailers the size of the noisy semis that ruin small talk in the sidewalk cafes of Broadway are beginning to appear on the backstretch. From up high in the grandstand, you can watch them come and go with a good pair of 7 x 50s. Except for the impression left by the guy driving – a wiry dude in a wife-beater and ball cap and a Marlboro hung from his lip, the massive 10-wheelers look like toys, the kind that you add to the train set you place under the blue spruce at Christmas time. 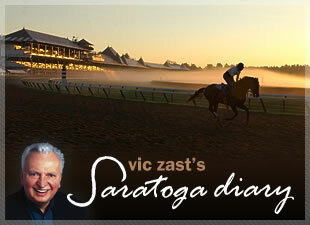 It must be hard leaving Saratoga for those who reside in New York the rest of the year. Horse racing’s on the front page of the newspaper here. The thoroughbreds enjoy being close to nature, breathing in the cool air and eating real clover under tall shady trees. The help, despite sleeping in wretched backstretch residences, are treated by Marylou Whitney and John Hendrickson to a movie or a meal or something fun every evening. It’s the jockeys who must regret the leave-taking most. In Saratoga Springs, a jockey’s a star. He walks tall through the crowds, signing autographs. People recognize him in restaurants, shout his name in the streets and ask to shake his hand or pose for a photo. In the featured P.G. Johnson Stakes for turf-favoring two-year-old fillies, Castellano rated Kinsman Stable’s Fancy Point on the lead down the backstretch, showed patience as Pleine Forme came close as the horses came out of the turn and then stepped things up again to leave the field wanting. Castellano added another victory aboard Slick Wheelie in the tenth race. Sheikh Mohammed’s Regal Ransom was favored to beat Cool Coal Man in the fourth. It was a 1-1/8 mile optional claiming race on the main track that turned out to be just what he needed. Kantharos, considered to be the nation’s leading juvenile colt, broke a bone in his leg on Monday and was retired. He’ll be okay eventually, although owner Jess Jackson, still smarting from Rachel Alexandra’s loss, must be thinking he’s snake-bitten. In nearby Newburgh, NY, some townsfolk conspired to bake a seven-foot, 130-pound cannoli. This Saturday, the Saratoga Farmers’ Market will hold a contest for the biggest and heaviest zucchini. Your zucchini and you must be in attendance at noon to claim the prize. Vic Zast is the author of the award-winning book, “The History and Art of 25 Travers.” He has attended at least one day of racing each summer for the last 47 years.